As you know Elder Curtis and I are both on a new diet as of January 1. We received permission to go to a gym for our morning workout so I got a membership to the YMCA. This is not going to be a long-term thing. We just received permission to do service at the YMCA so soon I think we will be able to work out there for free. This week has been a fast one. We were not in our area for the whole week. 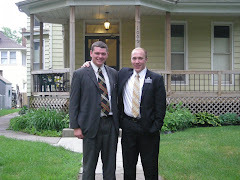 Monday was P-day of course, Tuesday I went to West Des Moines with Elder Russon, Wednesday we traveled to Ames with the Elder Jones and Harris in the 2nd Ward, Thursday we had district meeting in Ames then traveled to Newton and stayed with Elder Clarke and Harmon through Friday. We traveled back to Ankeny, got some new clothes and went up to Story City with Elder Ballard and Poulson for Saturday. It was fun to see everyone and see how they teach and find people. We all have the same message but everyone does it differently. We really got ahold of where the zone is at right now. As you know, last transfer we slowed down over some big stumbling blocks. Now we can see some of the small details that are slowing us down to our goal, "500 to heaven in 2011!" (its our new baptismal goal for the year) The family that that we have been teaching for the last month or so moved this week. They were five on the baptism dates that we had set. We are still teaching N, who has a date for the 26 of Feb. We had to move it back a couple of weeks in order to get him ready. So now our teaching pool is cleared out and it's time to go out and find some new ones. It what the Lord wanted so we will do it. I hope you got those pictures from the baptism that I sent last week. I also forwarded some pictures from leadership and zone conference today. You will have to play a "Where's Waldo" to find me. I had a question, I read every thing that you send me, but I don't always respond or talk about it. Sorry. I read your letters on Wednesday or so and by the time Monday rolls around I forget what I was going to ask you. But I did want to ask about the Contractor License that dad applied for. Did he get it? How's all that going? This last Tuesday I was sweating a little bit. Brother Jeffrey Beck and Brother Richard Heaton from the MTC were here touring our mission. So we were going to be with one of them or President Jergensen for the night. Luckily, we were paired up with President Jergensen. So we went to a less active's house and met with her for a time. Then we went to a lesson with an investigator family that we have been working with. This family is a little chaotic, a lot of people in a small apartment, a little dysfunctional but with hearts of gold. So we get in there and people were running around. We asked what was going on, and come to find out that one of the kids in the family had recently broke out in hives. They were on the phone with the station nurse trying to find out what they could do. Come to find out that President Jergensen had a career as a pharmacist. So he took a look and told her to take 800 mg of this and 500 mg of that and so on. He got her all fixed up and back to normal. We were able to share a little spiritual thought before we left. It was an awesome experience to take President Jergensen to a real Iowa lesson. We have seen a surplus of success this week. We invited the whole family (the one I was talking about) to be baptized, as well as a young man, N, who we have been teaching. The family is committed to the 5th of February and N is committed to the 12th. It's a real exciting time right now, and its going to be a push of faith to see them baptized next month. Note: Brady forwarded 31 pictures from his Mission President and they were all of large groups, and he was not in all of them. This was definitely a "Where's Waldo" exercise. The last picture was worthy of a close up crop. This is Brady and his companion, Elder Curtis. I believe this is the famous "Fizz Face". We had a sweet baptism on Saturday. Our ward Mission Leader was out of town so we really scrambled to get everything done in time, but we managed and everything went smoothly. I think that I have told you most of the story in bits and pieces within the last few weeks concerning J and his wife K but I may have left some things out. K had been less-active for some time due to a rough previous marriage to a non-member. Sadly it ended in a divorce. K met J at work (they are both accountants). After dating for some time J was introduced to the church by K's dad. He gave him a couple of books - Our heritage, True to the Faith, a Gospel Principles manual, and the movie Legacy. 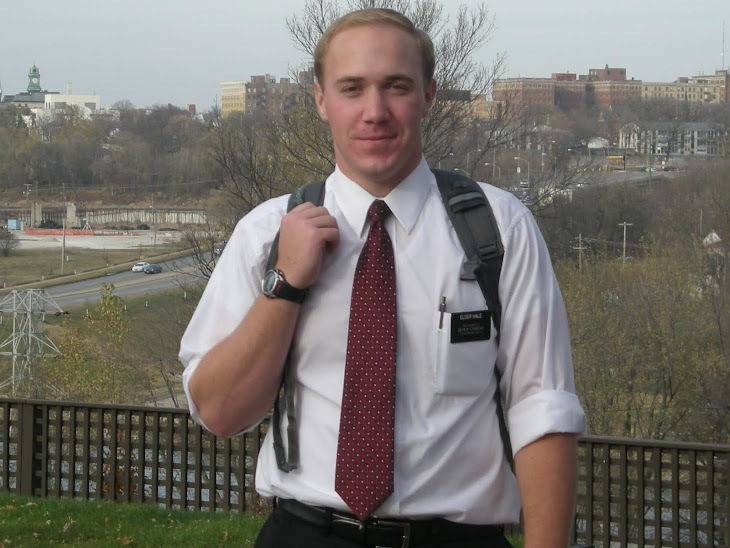 J was the one that wanted the missionaries to come over and learn more about the church. (K told us that she even tried to talk him out of it, but he was persistent.) So by the time we started to teach him he already had a testimony. Then as you know while teaching J and committing him to baptism, K said that she wasn't sure about the whole thing. She said that she didn't know if she had a testimony and that it was right for their family (they got married last Saturday). So our focus turned to her. After working on that for a couple of weeks she was in full support of J and the baptism. J has been a stud from the beginning. He's had a ton of faith through it all. So at the baptism while J and Elder Curtis were changing, we had a small testimony meeting. It started off with two of K's brothers. 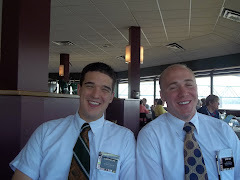 By that time J and Elder Curtis were back. Then by surprise, K was invited to come up and bear her testimony. Now I have to mention that K is kind of quiet so to hear her speak was sweet. She got up to the pulpit and said a few words about how proud she is of J. She then started to talk about how persistent we had been through out all of this even though she, at times, did not want to meet with us. At the end of her testimony she said that she was looking forward to being sealed in the temple and then said "Thank you Elders". She got a little emotional about it (I did too, I'm a bawl baby when it comes to things like that) but it was awesome to see a change of heart in a person like that. From going to inactivity, to a full-on reconversion, to go to the temple. It was great for the both of them. Happy Anniversary! Your one year mark comes up this Thursday !! Then it's all down hill from there :) In some ways it's gone by so fast, and in other ways it seems so long. But it's all good. Do something to celebrate! Or at least take a picture of something you guys are doing that day. Yeah, I'll do something great for my one year mark, and get some pics for you. A lot has happened so I"ll try to recall everything. Monday night started out with exchanges with the Assistants to the President. We went to their area in West Des Moines and stayed the night. It wasn't anything too crazy, we mainly tracted. It was different from the IPM, but all and all a good learning experience. They did tell Elder Curtis and I something that scared us though. In a couple of weeks there will be two MTC directors/researchers that will be touring our mission. There has been some new training and fundamental that has been focused on out of Preach My Gospel with missionaries world wide since July 1. One of these MTC guys is going to be with Elder Curtis and I for 2 nights to get a taste of where the mission is at. Kinda scary...all I can think is that song that goes, "under pressure, pushin' down on you, pushin' down on me....under pressure" You know that song. In other news J! The investigator that i have been telling you about, the one with the baptismal date and the fiancee who used to be a less-active and is contemplating the whole idea about J being baptized, well we had a lesson with them Saturday and we were teaching the doctrine of Jesus Christ out of 2 Nephi 31 and showed her the importance of baptism and everything. We asked her again about what she thought about the whole idea about J being baptized and she said that this last week she realized that she did have a testimony, but she just didn't want the commitment. But after thinking about it, and talking to J about the whole thing she knows that this will be a good thing for their family and she is now behind J and supporting him. So he prayed about the 15th of January and he feels that it is right, so he is going to be baptized!! This last week we have been teaching this family of about 7 individuals. The mother J is a less active member that has been looking for the missionaries for some time. They all have lived a rough life, and recently one of J's daughters was in a car accident. She was on life support and J and the other family members totally blamed God for what had happened. Then we tracted into her. We have been teaching their family for the last 2 weeks and 5 of them including J came to church yesterday. We were sitting there during fast and testimony meeting and all at once J, her two daughters, and her son went up to the pulpit all at once. The whole family surrounds the pulpit and J says, "we are new to this but we wanted to come up here as a family and say a few things." They started to bear their testimony individually, on how they came to know that there was a God and how he is now leading their lives together, and thanked us that we had knocked on their door. You know me I'm a bawl baby so I started to get a little watery eyed. It was so simple but it was the most powerful testimony thing I have ever heard. After church J's 3 children and brother were asking to be baptized, it was amazing. God has his arm stretched out here in Ankeny, and it's a blessing to help Him with his work. If you'd like to leave a note for Brady for his one year mark, leave a comment here, or e-mail me, or leave a message on my facebook or Brady's facebook. I'll forward all your well wishes on to him. Or you can write or e-mail him directly, his current address is on the sidebar. THANKS!